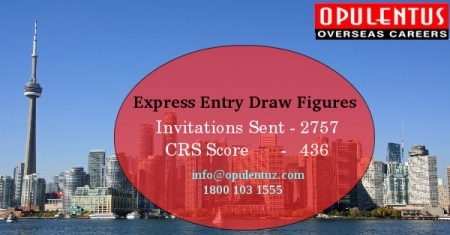 The Express Entry draw, which was held on 18th October 2017, for facilitating Canadian immigration has witnessed the extending of an invitation to apply to as many as 2,757 candidates. The points in CRS needed by the aspiring candidates stood at 436, which is two points less than the requirements of October 4th draw. The candidates invited, get a time frame of 90 days, from IRCC, to submit their completed application, to get the PR to Canada. The persons who are eligible to accompany the applicant to this destination are Family members, a spouse, common-law partners, and the dependent children also. In the last six draws spread over three months the CRS has seen a cut-off threshold in mid-430. There is a decrease, in every draw, for the number of ITAs issued, in comparison to the draws size that was conducted in the preliminary months of the year. The changes put in place gave additional points and helped the candidates immensely when they had French speaking ability or had a residing sibling in the country. After this draw, the ITAs issued, during 2017 stand proudly at 74,978, after 24 draws. This can be compared with 28,409 of the ITAs, that were issued during the 24 draws of 2016, and also exceeds the total number of candidates, to whom the invitation was issued in 2016. The present situation reveals the diversity of candidates. There is importance to English proficiency, and now the aspirants range from accounting professionals, electrical engineers, computer programmers, and financial managers. The factor running in their favor is a sister residing in one of the provinces with a PR. IRCC has a simple process to invite candidates, to get PR Status on a regular basis. The new Immigration Levels Plan is slated to be proclaimed shortly, and the newcomers, who can reach Canada by Express Entry for the next year, would be revealed. The Immigration Minister had mentioned that the annual target of 300,000 fresh immigrants annually will form the foundation for all the future draws. An enhanced target under the programs would lead to big draws or a fast frequency of draws. This will lead to a reduced CRS threshold in the draws. To Get More Information about Canada, Please contact us at [email protected] or Dial to 1800 103 1555. One of our experts will meet your expectations and provide answers to your queries.